The first biography of the little-known real-life Tom Sawyer (who Mark Twain met during his brief tenure as a California newspaper reporter), told through a harrowing account of Sawyer’s involvement in the hunt for a serial arsonist on the loose in mid-nineteenth century San Francisco. When 28-year-old San Francisco Daily Morning Call reporter Mark Twain met Tom Sawyer at San Francisco’s steam baths in 1863, he was seeking a subject for his first novel. As Twain steamed, played cards, and drank beer with Sawyer (a Volunteer firefighter, Customs Inspector, and local hero responsible for having saved ninety lives at sea), he had second thoughts about Shirley Tempest, his proposed book about a local girl firefighter, and began to envision a novel of wider scope. Twain learned that a dozen years earlier the eighteen-year-old New York-born Sawyer had been a “Torch Boy,” one of the young men who raced ahead of the volunteer firemen’s hand-drawn engines carrying torches to light the way, always aware that a single spark could reduce the all-wood city of San Francisco to ashes in an instant. In fact, at that time, a mysterious serial arsonist known as “The Lightkeeper” was in the process of burning San Francisco to the ground six times in eighteen months – the most disastrous and costly series of fires ever experienced by any American metropolis. Drawing on deep archival sources such as actual San Francisco newspaper interviews with the original Tom Sawyer and the handwritten police depositions of the arrest of the Lightkeeper, bestselling author Robert Graysmith vividly portrays the gritty, corrupt, and violent world of Gold Rush-era San Francisco, terrorized by an arsonist and simultaneously overrun with gunfighters, gangs, hordes of gold prospectors, crooked politicians, and vigilantes. 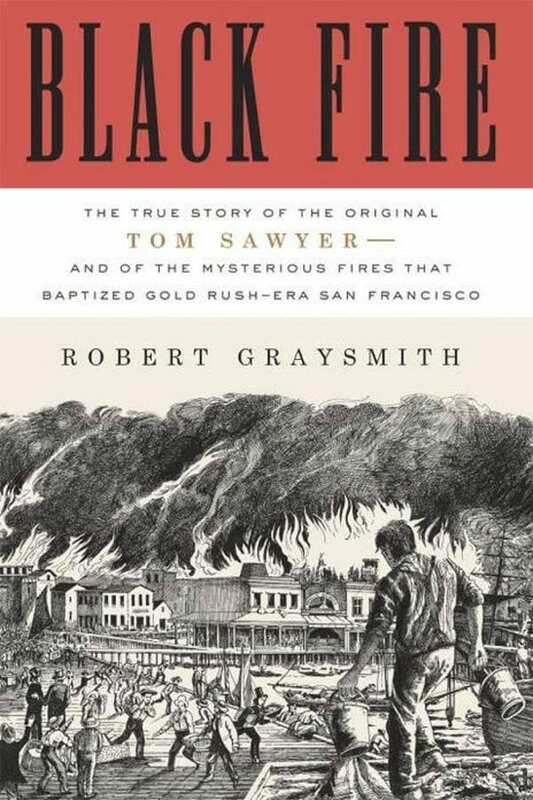 By chronicling the story of how Sawyer took it upon himself to investigate, expose, and stop the arsonist, Black Fire tells – for the first time – the true story of Sawyer’s remarkable life and illustrates why Twain would later feel compelled to name his iconic character after his San Francisco buddy when he wrote The Adventures of Tom Sawyer.